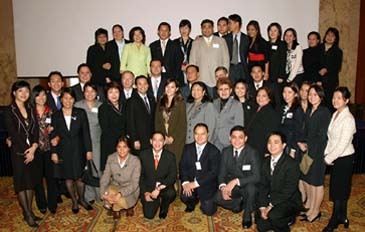 The Philippines Tourism Secretary Joseph Ace H. Durano returned home on Nov.10, 2006 after winding up his successful three-day visit here as the head of a high-powered Filipino delegation to the 5th Philippine Hotels, Resort Road Show in three major cities in South Korea. The annual event was among the highly-successful components of the DOT's marketing campaign in Korea, which is now the largest Asian market for the Philippines tourism, averaging approximately 45,000 Korean tourists a month. This makes Korea the Philippines' second-biggest source of foreign tourists, accounting for 19.5 percent market share during the first eight months of the year. 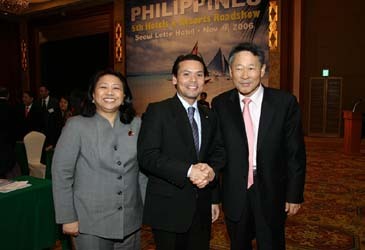 Philippine Tourism Secretary Joseph Ace H. Durano (center) poses with Mr. Kim Kyong-Hae (right), CEO of South Korea's famous Communications Korea PR agency. At left is Ms. Maricon Basco-Ebron, Korea regional manager of the Philippine Visitors and Convention Bureau (PVCB), marketing arm of the Department of Tourism (DOT). For the full-year 2006, the PDOT is targeting 600,000 Korean visitors, or a 20 percent increase from almost half a million registered in 2005 when the Philippines tourism posted an all-time high of 2,623,084 international arrivals, according to Ms. Maricon Basco-Ebron, head of Team Korea. "To sustain the momentum, the Philippines government will continue to pursue cooperative endeavors in tourism, including the sending of Korean instructors to teach the Korean language to tourist front liners, the conduct of cross-cultural learning programs for Korean executives based in the Philippines, and the undertaking of joint ventures to develop tourist sites in the country," she said. While here, Secretary Durano spoke to members of the Korean travel trade community, and delivered a special lecture entitled "The Philippines Tourism and Beyond" the Sejong University here on Nov. 10. With the Philippines emerging as one of the top choices for overseas education in Asia, Tourism Secretary Joseph "Ace" Durano told 300 plus students at Sejong University that the Philippines is one of the leading education destinations in Asia, particularly in learning the English Language. He mentioned such leading learning institutions that offer English as a Second Language (ESL) Tour Programs. Among them are Miriam College Language Learning Center, Terra Nova Ventures CorporationTerra Nova Education, Top English Center Foundation, Global Languages Inc., Baguio English Communication Institute, NEO International Language School, La Salle Language Center-Bacolod, University of Cebu ESL Center, International English Center, Cebu International Academy, Monol International Education Institute, Cles First Center for Language Orientation Corporation, Best English as a Second Language Academy Inc., Phoenix One Knowledge Solutions Inc., JIC Tutorial Language Corporation, and Modern Languages International. DoT's Team Korea Head Maricon Ebron said that they are now more aggressive in promoting ESL, specifically in South Korea. "We saw a big potential in this market and this is something where we could really compete and excel given the quality of our English language courses and educators." "Koreans prefer the Philippines mainly because of its proximity and relatively affordable cost of education. Parents or families can even visit their children while they are in the Philippines studying," she said. Philippine Tourism Secretary Joseph Ace H. Durano (right) poses with S. Korean singer Eugene, PR ambassador for the Philippines. 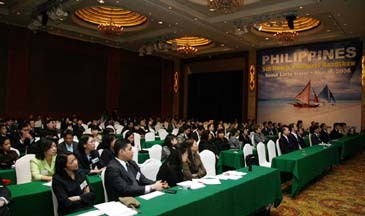 In the course of lecture, Tourism Secretary also elaborated on the tourism development strategy initiated by the Philippines President Gloria Macapagal Arroyo, who has grouped the archipelago into five super-regions for various investment purposes such as central Philippines, which shall be the centerpiece of the country's tourism development. Consisting of 27 provinces, the central Philippines covers the Visayas and Bicol regions, the northern Mindanao islands of Camiguin, Siargao and Dapitan, and the island provinces of Palawan and Romblon. "This super-region is the Philippines' premier tourism destination as it accounts for seven out of 10 most-visited beaches in the country namely Cebu, Boracay, Oriental Negros, Bicol, Samar, Palawan, and Mindoro. "Moreover, this super-region will be developed under the Central Philippines Development Project," Durano added. Secretary Durano's speech on the subject capped the six-day event, which attracted some 850 to 1,000 wholesale and retail buyers in the three key Korean cities. The roadshow focused on the Philippines tourism properties that are new, with major renovations, and with new products to offer. All these properties were presented by a 37-man private sector delegation led by the DOT's Team Korea and PAL. The properties are the Holiday Inn Galleria, Diamond Hotel, Sofitel Philippine Plaza, Hyatt Hotel & Casino, Makati Shangri-La, Traders Hotel and Peninsula Hotel in Manila; Alegre Beach Resort, Hilton Cebu Resort & Spa, Marco Polo Plaza, Maribago Bluewater Beach Resort and Shangri-La Mactan in Cebu; Bohol Beach Club; Boracay Regency Beach Resort, Discovery Shores Boracay, Seraph Hotel and Patio Pacific on Boracay Island; Dos Palmas Arreceffi Island Resort and El Nido Resorts Lagen Island in Palawan; The Marco Polo Hotel in Davao City; Pearl Farm Beach Resort in the Garden City of Samal; the Capitol Complex Hotels in Camarines Sur; and the Southeast Asia Airlines. Aside from product presentations, there were cocktail receptions, sales pitches, travel marts, networking activities, catalog placements, and hosted functions in each city. In particular, a group of Korean distinguished figures including Dr. Yoon Tae-hee, chairman of the board of Arirng TV, Lee Jeong-woo, a standing adviser for Hana Financial Group and former president-publisher of the Korea Herald and Lee Chong-hwan, vice chairman of My Asset Investment Management Co.,Ltd. disclosed a plan to activate a friendship association to bridge between Seoul and Cebu. The gathering was tentatively named as " Friends of Cebu Club in Seoul," according to Dr. Yoon who is concurrently standing adviser for International Finance Corporation (IFC), the private sector arm of the World Bank Group.